Within the published text accompanying the 10 Tavola’s of Andreas Biancho1, Professor Piero Falchetta has included a brief description of each from a historical viewpoint. 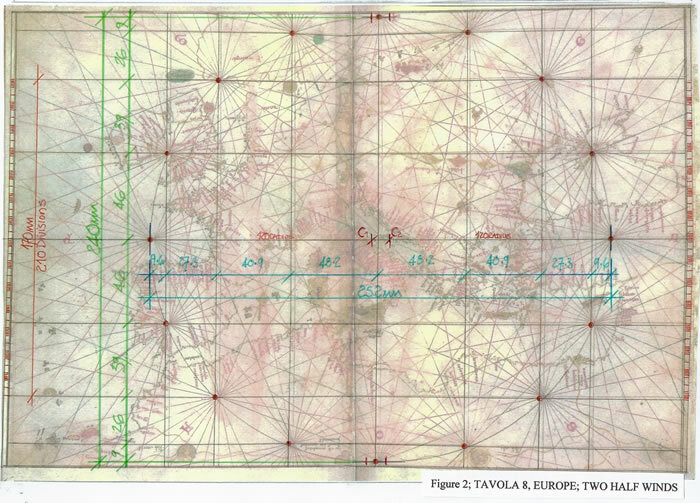 But upon the charts, Tavola’s 2 to 8, is a great deal of information, technical information that can be gleaned from the actual draughtsmanship, geometry, trigonometry and measurements used. This tells a story of how the whole was conceived, drawn, annotated and presented, and thus allows many questions to be asked and answered that the historian deems perhaps unimportant. But, if the charts were not so constructed and drawn the historical content and thus the whole context could not be discussed by historians and our knowledge increased. 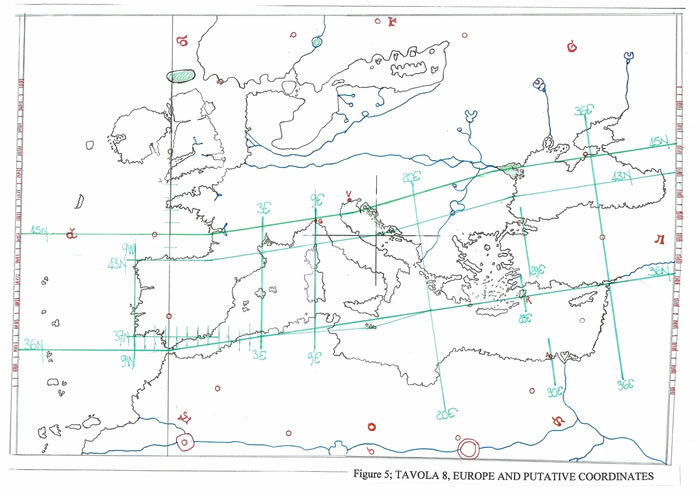 This text concentrates upon just three of the ten Tavola’s; Tavola 8, the overall map of Europe; Tavola 9, the circular World map and most importantly Tavola 10, the Ptolemaic World map, which is as stated of questionable provenance. This chart, figure ChAb2D01, is a Portolan with standard magnetic deviation for the eastern portion. The Iberian Peninsula has been drawn NSEW and the charts central position is delineated by the 43N/15E co-ordinates. The wind rose is 240mm diameter. There is a full description of this chart within the text following. The basic chart appears to emulate six of the previous seven chart tavola’s in its graticular sub-divisions, but, there is an anomaly with the measurements as figure ChAb2D02 illustrates. The latitudinal measure is as the six charts, 240mm or 11 uncia, but the longitudinal measurement is 252mm (probably meant to be 251mm and thus 11.5 uncia). The paper size is again 262mm or 12 uncia and is c380mm long probably cut from a 393mm sheet. The measurements obviously indicate that a circle could not have been drawn to locate the basic winds and the graticule there-of. But an examination of the chart does indicate that it is two semicircles with the wind positions precise in each half. This is shown as a radius of 120mm or 6 uncia is being used to locate the two sectional winds. The scale bars set at the east and west sides of the chart use the four central squares as the distance measure, 170mm, representing 210 divisions. As is shown by figure ChAb2D03, the six charts have three separate scales all derived from the basic sub-division of a circle into 11.25 degrees or quarter winds. They are 35, 45 and 50 units long. The scale bar of figure ChAb2D01, having 210 divisions is nonetheless part of the same system and is subtended by a 45 degree wind alignment. Thus the base scale of 50 units has morphed into the 35, 45 and 210 units as shown. But the scale has had to be manipulated such that it is applicable to both the latitudinal and longitudinal measurements of the chart. 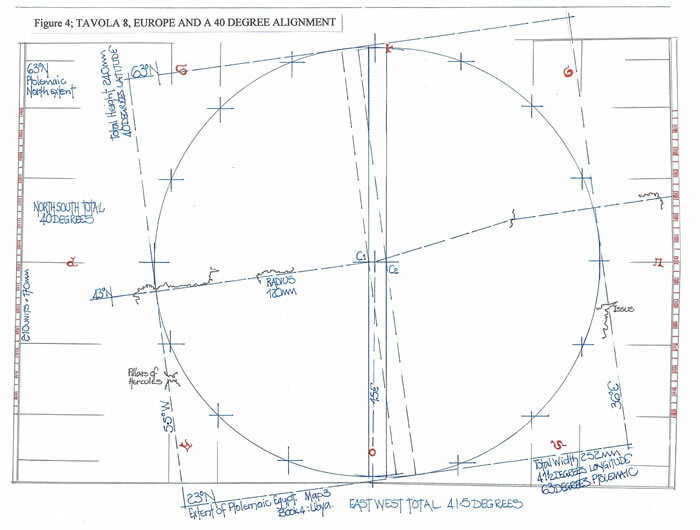 Hence the 240mm diameter circle expands to 252mm and the extra 12mm is used to produce the correct measurements. The Venetian Miglia or Mile of 1000 Passi or 5000 Piedi, is given as 1.7387Km2 and is the measure used within this text for the following calculations. Whether it was used by Andreas Biancho is conjectural, but as we do not have a unit of measure from within his texts we can only assume he was aware of his Venetian measures, and used them. An attempt has been made to ascertain a measure from the charts but this has proven to be so ambiguous as to negate any resolution. The charts miscellaneous scales preclude accuracy as do their latitudinal/longitudinal spreads which vary in an unfathomable manner. The longitude of 252mm is shown to represent a geographic distance of 41.5 degrees; that is from the Pillars of Hercules at 5.5W to Issus at 36E. But the centre of the circle is at 43N/15E and here a geographical degree of longitude equals 441.74 stadia of c185m, or c81.72Km. (Thus we can immediately recognize an error in the draughtsmanship). The calculation is; 604 stadia of c185m or 111.74Km multiplied by the cosine of 43N produces 441.74 stadia or 81.72Km and this equals a total of 47 Venetian Miglia per degree. It is not in the research of this paper to guess it may have been 50 Venetian Miles. But the charts of Andreas Biancho vary considerably with only two being square charts or a flat earth chart; that is latitude and longitudes are the same measure as has been shown to be the system for most of the Portolan Charts in existence. Therefore we can only calculate what the 210 units represent when set against the 41.5 degree measurement. If 252mm equals 41.5 degrees then a degree is 6.07mm and thus 170mm must represent 28 degrees. Quite simply, 28 x 60 = 1680 minutes which if divided by 210 equals 8 minutes per unit. And, there are 7.5 x 8 minutes in a degree. 240÷170 = 1.41176 x 210 units =296.471 units, which is in all probability 300 units, which at 8 minutes per unit produces a latitudinal spread of 40 degrees. We can now understand just how clever Andreas Biancho has been with his mathematics/geometry/trigonometry as the centre line is set at 43N, which allows, by using the 40 degrees spread calculated, for a northern limit of 63N, precisely as Claudius Ptolemy set down and a southern limit of 23N, which is the limit of Book 4, Map 3, “Libya embracing all of Marmarica, Libya and Egypt” again as set down by Claudius Ptolemy. This agrees precisely with the chart drawn by Andreas Biancho, and is illustrated by the circle and measurements as well as the geometry shown on figure ChAb2D04. It is obvious therefore that as Andreas Biancho drew this map he had a copy of the Map of Claudius Ptolemy, if not the text of “Geographia” to know these limits. That map is likely to be the Ptolemaic map enclosed with his ‘Atlante Nautico’, which was probably either a gift or purchase as, in all probability, (although questionable), it could not have been drawn until after 1407, and the date given by Andreas Biancho is 1436. The geographical lines of longitude and latitude have been appended to the figure ChAb2D05 and indicate that although the Iberian Peninsula was drawn NSEW and the longitudes continued eastwards until the 25E centre line, the magnetic variation was then introduced latitudinally from within the Iberian Peninsula. Thus only the south, west and north coasts of the Iberian Peninsula are drawn NSEW. The map, figure ChAb2D06, by Andreas Biancho is a curiosity. It has both Ptolemaic, Christian and Portolan overtones. Based upon the same circle as the previous 7 charts, 240mm or 11 uncia diameter, the inner circle is 218mm and thus 10 uncia diameter. But there is a flaw in the draughtsmanship; the east west measurement is certainly 240mm but the north south measurement is 247mm. This is only 3 ½ mm per radius error and could easily be accounted for by a minimal parchment expansion in the length and a slight wobble of the quill in the compass as the circle is scribed. That is a very simple error to make. But, it is an obvious error and was mostly original as the 45 degree wind lines are slightly off alignment when compared to the NSEW lines. In his text Professor Piero Falchetta has discussed the textual additions to the world map, but it is worth noting that the overall spherical shape of the world as drawn is based upon a 9 uncia circle set off centre to the east. One surprising feature is that the Red Sea, although correctly coloured, has been drawn as far to the east as the map is off centre. The terminus of the Red Sea should be south of the Eastern Mediterranean Sea. There are two further peculiarities on the world map; the circular intrusions into the outer framework. That in the south is 3 uncia in diameter, but the two northern curves, which are in fact centered upon the 10 uncia circle have no discernible radius/diameter, other than being 3 1/3 or 10/3 parts of the main 11 uncia circle. 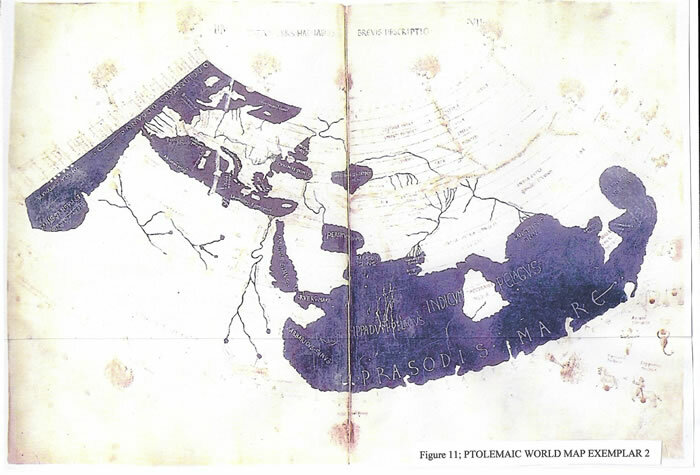 Included as the last map in the ‘Atlante Nautico’ is a Ptolemaic based map of the oikoumene using his first projection as figure ChAb2D07 illustrates. Originally these maps would have been drawn from the co-ordinates given in “Geographia” by Claudius Ptolemy. That text was written c150AD, translated into Latin from Greek in c1406AD and subsequently copied both by hand and printing and widely distributed in Italy. (See cautionary note at the end of section). However, as knowledge increased so the maps were altered to suit the new data. Thus in the intervening years, 1406 to 1436, Andreas Biancho possibly became aware of the text and possibly the maps which can be drawn there from. This text has shown that on Tavola 8, the Ptolemaic world was known to Andreas Biancho by virtue of the latitudes. 2) the way the text is written and the correct use of abbreviations ( i.e. Latin abbreviations.) would suggest at least one other scribe at work on the map itself. 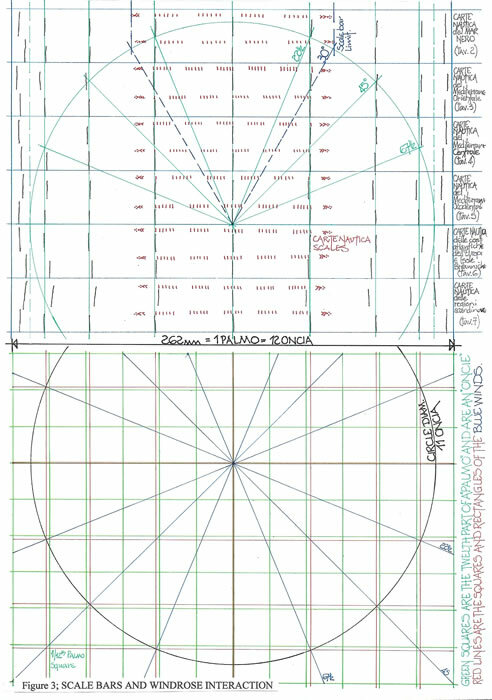 3) it is not inconceivable that it can be determined as drawn after the atlas was completed, but could also be coeva. “The hand (or hands) that composed this Ptolemaic mappa mundi using his first and conical projection does not appear to be the same hand as previous writings in the other tables in the atlas. The use of capital letters, ‘ductus’ and the letter forms; correct use of abbreviations; the Latin is not ‘crippled’ etc, are all elements that will lead us to surmise that Andreas Biancho could have participated in the design of the map, as we will see later, but that the allocation of the whole map’s authorship on the other hand cannot be totally his. It would be scientifically prudent for a comparison by paleographic means with surviving Latin manuscripts of Ptolemy, perhaps the first recorded belonging to Palla Strozzi and now the text, Vatican Graeco 82, (figure ChAb2D10) or 5698. A certain resemblance between the mappa mundi of the manuscript and the mappa mundi of the Codex Marciana can possibly detect some elements, such as the shape of letters for the names of the African area which are also in red ink as the codex Marciana; the trend of the Nile and other rivers in the western part of Africa and, in general, the description of the different countries of Asia. The codex Marciana seems less prone to distortion and is a more accurate map of the world than the mappa mundi in the Vatican codex for the Mediterranean. Since also the world map in the tavalo above shows in that part that there is a lesser degree of distortion to the rest of the design, you can probably assume that by the representation of this region on the Ptolemaic World Map, Andreas Biancho may have directly contributed to it with his experience as a nautical cartographer. The European continent in particular, conforms to the model of a more nautical chart than that of Ptolemy, also in the form of the Iberian Peninsula and Greece and especially in that of Italy, which does not show here the excessive tilt of orientation West-East and the sudden inclination to the south of the southern part of the Italian Peninsula, which are distinctive features of the Ptolemaic map. Scholars have generally paid little attention to this representation, and have considered, perhaps wrongly, it is less interesting than the ‘medieval’ world map that 3precedes it. Actually this map appears today, when you are evaluating the contribution of Ptolemy to geographical knowledge that will develop later in the course of the Renaissance, to be of great historical importance. In fact, it is probably derived from the most ancient of manuscripts received in the west. The ‘earliness’ with which it began to circulate, the fact that the atlas has a geo-mapping element are all parts that have to be evaluated with due care. 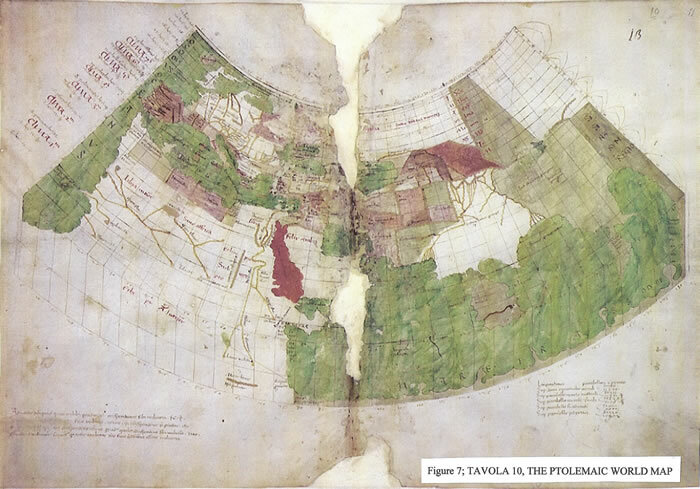 The Ptolemaic map of the world, although much damaged in its central part, has some structure and the same ‘readability’ as the other tavalo’s in this codex, and cannot not be coeval with those. It is not inconceivable that it could have been executed after the atlas was bound in its original form, that is, ‘in quarto’. ‘The text of the British library’s manuscript Harley 3686 is an undated and anonymous Latin version of Ptolemy’s Geographia with an innovative set of eighteen non-Ptolemaic maps of Europe, Asia and Africa. Links with Andrea Bianco’s nautical atlas (1436) suggest a Venetian provenance for the manuscript and a date of between 1436 and 1450’. Thus having dealt in a cursory manner with the visual content of the Ptolemaic World Map it is necessary to investigate the actual preparation of the conical projection. The above text is a complete guide to the construction of a conic projection onto which the oikoumene can be drawn. It is carefully proportioned as figure ChAb2D08 illustrates such that the extent of the oikoumene from 160 25’ south to 63N, and from 0E to 180E is portrayed in a proper manner. Hence latitudinal divisions are set down precisely and longitudinal divisions correctly proportioned. The “Klima” are a separate set of latitudinal bands which have only been used in one section of the actual text, “Germania” to describe the maps form and thus are not the primary determinant for setting down the maps. In order to be as accurate as possible in this research, the tavola as presented in the book “Atlante Nautico 1436” has been used for the research and the downloaded copy available on the ‘Geoweb Site’ of the ‘Biblioteca Marciana’ as the exemplar. Firstly on visual inspection it was immediately apparent there were draughtsmanship errors, such as the longitudinal lines below the Equator were vertical and not tapered. This is contrary to the instructions given. The next obvious error or deviation from the original design is the latitudinal spacing northwards from the equatorial line; the first 7 lines appear to be the same distance apart, the next 6 a variation and the final 4 + 1 vary yet again. These are obviously as noted the “Klima” bands and are delineated on the eastern edge as being in mostly pairs of lines, but, these are not actually useful when drawing the maps or the World Map of the oikoumene, as the co-ordinates are normal degrees and the “Klima” bands vary, as is illustrated by figure ChAb2D09 and the schedule attached thereto. 2) utilize the “Klima” degrees spacing of varying divisions south to north and guess the intermediates as best possible from the latitudes given. The major codices produced from the 1460’s onwards tend to have the “Klima” sections noted upon the western edge and the latitudinal degrees along the eastern edge for the projection of the arcs. This Ptolemaic diagram uses only the “Klima” divisions in a cursory manner. Thus it is clear this is not a standard Ptolemaic projection, but a local variation by the cartographer involved. Thus it is possible to opine that the Ptolemaic Map within the ‘Atlante Nautico’ of Andreas Biancho is probably a poor copy of an extant Ptolemaic Map. As stated the facsimile copy of the map is being used as it is actual scale. Set on a parallel motion drawing board the maps major features can be aligned; they are the east/west points of the upper arc, the same points for the equatorial arc and then the southern limit arc. These proved to be parallel and thus should have had the same center for the arcs. But, the first problem appeared when the two extreme sides were projected towards a notional centre point. 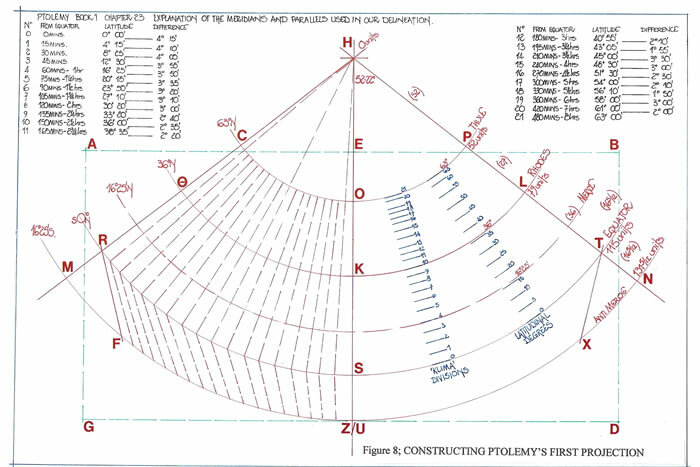 They should have subtended an angle of 104/105 degrees as was shown in the correct construction of the conic projection, as figure ChAb2D08 illustrates. The angle subtended is in fact 90 degrees, and is eminently suitable to use as a subdivision marker for the 180 degrees required, but obviously is out of scale and thus proportion to the design. This confirmed that the map was not drawn to the correct design, but a variation. 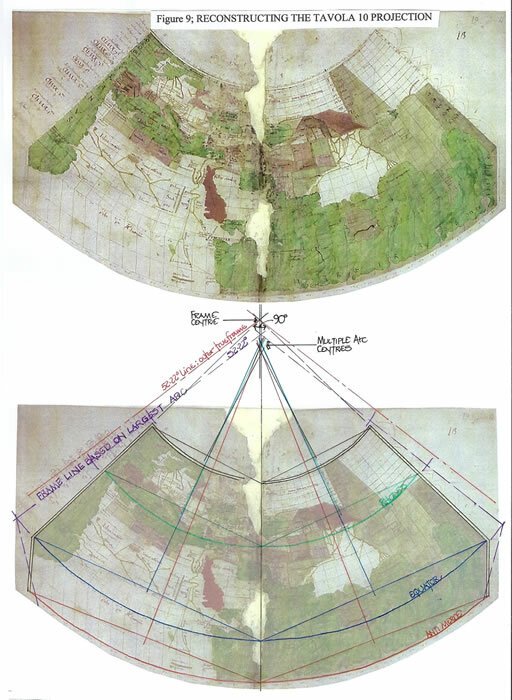 The arcs were then tested and as has been shown within the investigation of the Genoese 1457 Chart (4) once the centre points are outside of the parchment borders there is the opportunity for a large inaccuracy to occur. If the centre points are in fact on the base board or even the table used for support, the central point necessary can be degraded very quickly. Thus on this map there are at least 4 different radii points all within close proximity to each other but all producing differing arcs and thus problematic map construction. Thus it is quite evident that the cartographer knew of the first projection method of Claudius Ptolemy but has chosen to invent his own version, or make a poor copy. The text panels are a mixture of Miliaria and Stadia measurements. The four lines of text in the west indicate that Andreas Biancho or A N Other established that a degree of latitude or equatorial longitude measured 56.667 miliaria. In that way we find that the value of a degree on the celestial sphere, taken on the circumference of the earth is 56.667 miles, each mile being wqual to 4000 black cubits, as was ascertained during the time of al-Ma’mun- may God’s grace be upon him! And, on this point a large number of learned are in agreement. The task was carried out between 820 and 833AD, and itself inserts a frisson of doubt into the research with the precise length of the black cubit. Its length could be from 540.8 to 498 to 482.5mm. But quite frankly each gives an answer so close to the geographical world circle and thus the length of a degree at 111.74Km that the difference is irrelevant. We have either 109 or 113Km per degree from the cubits that are most likely to be used. But of course, in the West the length measurement was merely thought to be the standard local mile measurement, and instead of the 56.667 miles being c111km it became c84Km, a smaller world which created problems later for Christopher Columbus. But, Andreas Biancho is some 50 years prior to Columbus and could well have known from the works of Sacrobosco (d 1256) or Pierre d’Ailly (d 1410) that the figure of 56.667 miles was given as the single degree measure, called a mile and thus mis-understood. Thus we read in the texts appended that a degree is 56.667 miliaria, 1800 equals 10200 miliaria and 900 equal 5100 miliaria, all from 56.667 x 3600 equaling 20400 miliaria. However, a dichotomy exists from a study of the two texts. The eastern text is in fact an approximate copy of Book 7, Chapter 5, of “Geographia” by Claudius Ptolemy. The differences are marginal and the conversion of Stadia to Miliaria is 8:1 as standard. But now we have two world circles: the western text world is 56.667 miliaria per degree and thus a world circle of 20400 miliaria; the eastern text world has 11250 miliaria for 180 degrees and thus 22500 for the world circle. This latter circle is of course 62 ½ miliaria per degree and thus the two are 1.1029 or over 10% different. Did Andreas Biancho, having shown his expertise ( unless of course he copied it all) with the mathematics of the ‘Raxon de Marteloio’ not recognize that he had written differing measurements for the world circle, 20400 and 22500 miliaria, or is it the result of two separate scribes? In fact is the script on the actual map a third person’s work? To be able to draw the World Map of Claudius Ptolemy upon his first projection, a cartographer must know the shape of each and every part of the map. Why? Even in the extant codices that have a copy of the medieval rendition of this map it is impossible to draw it accurately with the form of the landmasses correct as the scale is much too small to allow the 8000+ site co-ordinates to be used, or even just the littoral co-ordinates to be accurately used to draw a correct portrayal of the maps drawn. This map is on a parchment 260 x 380mm and is only 195 x 345mm overall. The average folio from the middle ages is two or three times the size, as listed in HOC, chapter 15, and appendix 15.1., but even so the individual maps would have been drawn first. Thus this map can only have been drawn by copying a “proper” version of the Ptolemy World Map which itself had been drawn from the amalgamation of all of the individual maps compiled from the data in books 2 to 8 of the “Geographia”. 1) Byzantine monk Maximus Planudes finds a Greek copy of “Geographia” in 1295 and since no maps were attached to the text, he drew (or had drawn) the maps based upon the 8000+ co-ordinates that make up the “Geographia”. 2) In 1397 a copy of the text was given to Palla Strozzi in Florence, by Emanuel Chrysoloras. 3) In c1407, Jacopo Angelus di Scarparia completes the translation into Latin of the Greek text of the ‘Geographia’. This translation had been commenced by Emanuel Chrysoloras. 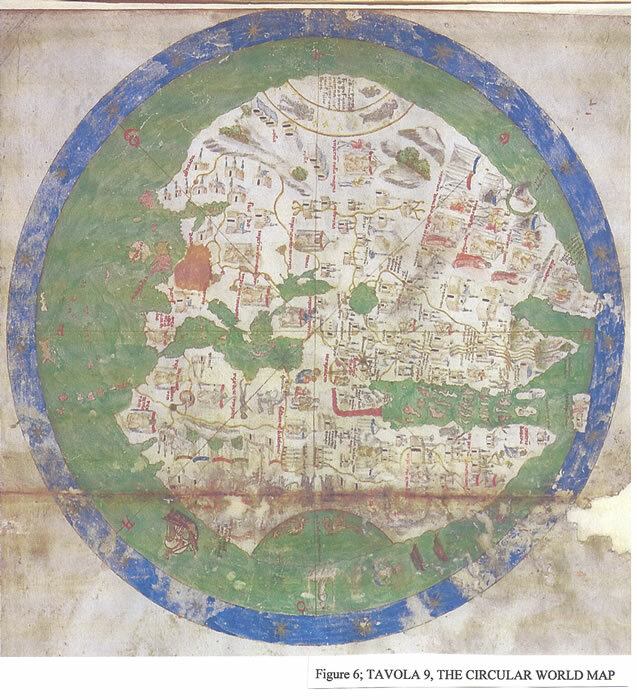 4) Between 1410 and 1435 a cartographer or cartographers drew each map according to the co-ordinates within the text and completed a World map using the first projection. 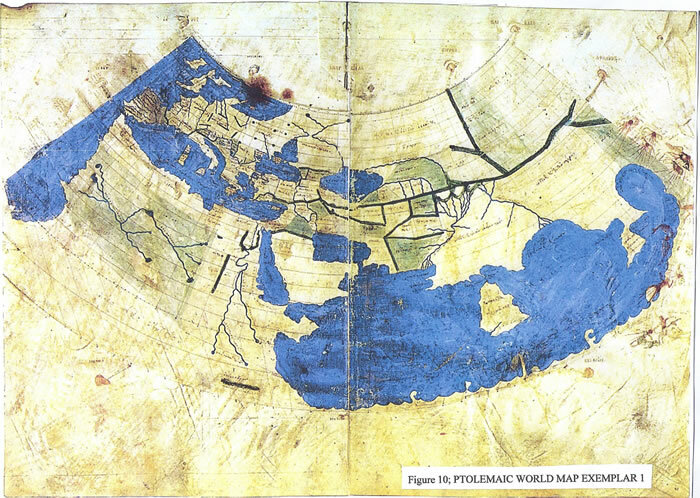 This is confirmed by the Pirus de Noha5 map of 1414 which is drawn as a copy of the Ptolemaic world map with Portolan pretentions in all probability at the Council of Constance where he worked for Cardinal Giordano Orsini6. Copies of the maps were first drawn probably by two Florentines, Francesco di Lappacino and Domenigo di Beninsigni7 must then have been distributed and one arrives in Venice. 5) In 1436, Andreas Biancho produces his “Atlante Nautico” which now includes a copy of the World Map drawn to a variation (proven here-in) of the first projection. Thus it is quite open for all to assume that the first Latin copies of the ‘Geographia of Claudius Ptolemy’, circa 1407/1410, had maps appended, or were appended very soon after the original Latin copies were made if the dates of 1414 and of 1436 for the Andreas Biancho map are upheld. But a caution must be appended here; in 1154 Al-Idrisi8 used a copy of “Geographia” by Claudius Ptolemy to carry out his exhaustive study of the oikoumene. The Island of Sicily was a multicultural multi linguistic society and the Benedictine Monks were well established there by King Roger II. They would have had direct access to all of the papers utilized and thus we should also countenance the possibility of earlier text and map availability. The Ptolemaic map enclosed with the charts of Andreas Biancho is a probably a copy of a properly proportioned original, but by a cartographer who did not have the benefit of the text that is included in the ‘Geographia of Claudius Ptolemy’. Thus the “Klima” have been copied, being the left edge, and normal for a right-handed person to use, and the right edge or latitude scale has been ignored, or just missed. The fact that there are brackets delineating the pairs of Klima measurements denotes a deliberate rejection of the latitudinal scales. The subtlety of the measurements has been lost with the lack of knowledge to use the Meroe latitude for the sub-Meroe and last arc measures. Thus we can opine that the maps of Claudius Ptolemy were probably drawn shortly after the text translation into Latin by 1409. But, that of course is if they do not pre-date the translation? 1 Ronald Edward Zupko, 1981, Italian Weights and Measures from the Middle Ages to the 19th century. American Philosophical Society, 1981, vol 145. 2 Marica Milanesi, 1996, A Forgotten Ptolemy: Harley Codex 3686 in the British Library. Imago Mundi, vol 48, 1996. 4 Mappamundi of Pirrus de Noha, taken from an early 15th C incipit by Pirrus de Noha of the De Cosmographia of Pomponius Mela. Now held in Biblioteca Apostolica Vaticana, Rome. (Archivio di san Pietro H. 31, fol. 8r). 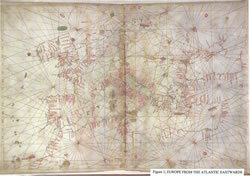 5 Evelyn Edson, The World map 1300-1492. 2007, The John Hopkins University Press, Baltimore, USA. Pp120. 6 Kirsten A Seaver, Maps Myths and Men, the Story of the Vinland Map, 2004, Stanford University Press, p223. 7 The text and discussions regarding Al-Idrisi can be found at On the carto-geographical page referenced as texts cg/Id/1, cg/Id/2, cg/Id/3 and cg/Id/4.